... you upstream a couple of files to your web server and the server process uses 50% of a Pentium III for a couple of seconds. I love that name: SlowParser. No doubt as to what it does. Time to go find myself a FastParser. I thought expat (quite a fast parser) was included in the Python distribution these days. Apparently not. Hmm, looks like Dave is up to something. It looks like Weblogs.Com now tracks RSS feed updates as well as weblog updates. Presumably this ties in with the recent focus on minimising aggregator bandwidth requirements. 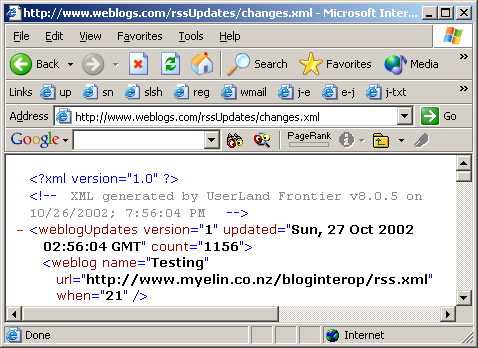 If you know a weblog always pings Weblogs.Com when it updates, you only need to download its RSS feed when it appears in www.weblogs.com/rssUpdates/changes.xml. Cool! Currently that page is showing a few Radio weblogs and some of the UserLand partners. Not to be outdone, let's see if we can get some other weblogs on there. UserLand's software almost exclusively uses the XML-RPC protocol for communication, which means it plays very well with other platforms. Especially Python, my favourite. Oh, very good. Now let's put this into bzero. I'm doing this as I type, so with any luck when I post this message, you should see pycs.net/devlog appear in the updates page. The weather here is shocking right now, meaning that pycs.net will probably just drop off the 'net as soon as I say this, but let's try it anyway. Update: As expected, DNS trouble meant Weblogs.Com couldn't get back to me. Here's the screenshot to prove that the Python code above worked, though.